Fridays are probably not the best day to look back when you’re looking forward to the weekend. But what about a weekend where you can look back on the best memories from gaming? 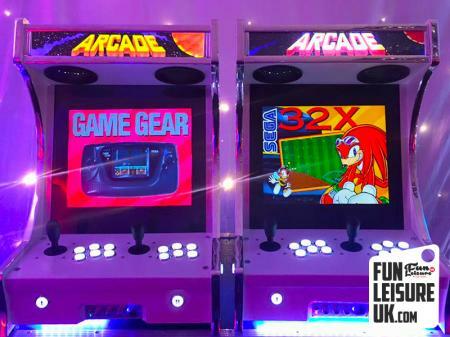 Handheld gaming devices are being released all the time with some of the best old school games on, but there’s nothing like playing them on a proper arcade machine hire! We’ve been delivering fun throughout the UK since 2008 and there has been a big surge in popularity of the interactive arcade games. Who needs full HD realistic graphics on the likes of Grand Theft Auto when a pixelated but seriously addictive game of Street Fighter awaits? We’re in no way against modern gaming but there is something just so beautiful about revisiting the past and dining out on Super Mario, Pokemon and Donkey Kong. One of our favourite flashbacks is air hockey. Speed, agility and usually aggression all come into play with this 80’s classic. Invented by three employees of Brunswick Billiards in the late 1970’s, air hockey has been a staple of UK arcades for years. The competitive side of air hockey leads to some great games and in the last nine years, similar to the arcade machines, we’ve noticed requests for air hockey tables as corporate entertainment are increasing. Our final flashback in the gaming world is definitely one of our client’s favourites. The stalls look like they do at the fun fairs and are even better when you’re in the thick of it. Despite the general idea of these games being so simple they are one of the most addictive forms of entertainment we send out weekly. We watch guests attempt to better their friends, colleagues or own scores over and over again, especially when the prizes on offer are very tempting! Interactive games are the perfect addition to any team building activities and we’ve seen a combination of games added to all kinds of events of all sizes. For pricing or more information give us a call on 01772 923990.